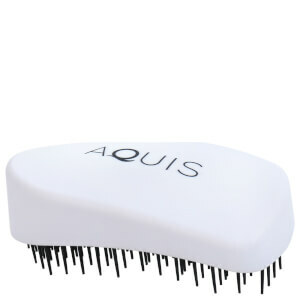 Pamper wet locks with the Hair Towel Waffle Luxe from Aquis. The towel is suitable for all hair types, but is ideal for thick hair, such as African and Asian. The fabric is constructed in layers and the waffle texture helps to create a larger surface area, which allows for efficient moisture wicking from damp tresses. Crafted with new generation Aquitex, the luxe towel boasts improved absorbency, as well as increased comfort. The towel wraps easily around wet hair, tucking in neatly to leave your hands free whilst hair dries. Using the Hair Towel Waffle Luxe helps to decrease drying time, whilst also working to minimise frizz and damage to the fiber.